That's a smart idea, buying a nice dress when you find it and tucking it away for when you need it. That always happens right? You have something to go to and all of a sudden nothing you come across is cute or appropriate and if it is, it is 100% in the wrong color. That scalloped dress is so cute and a lovely color. Definitely could see it being worn to just about any spring/summer event! 1O WEDDINGS?! I thought 5 was bad enough. I love love love that maxi dress - if I knew it wouldn't be too short on me, I'd be all about it. Ha, yes, all of my friends and Jeff's friends decided to get married at the same time. I'm guessing that next year there will be zero! The maxi dress - I haven't actually received it yet, but it says the model is 5'10" and it looks long enough on her, so I'm crossing my fingers that the length will work. Yes it definitely works for me! I think there's only been one dress that I purchased on the fly that I haven't found an occasion for yet, but it may make an appearance soon. I know I've said this before but your monthly purchase round ups are my favorite posts you do. 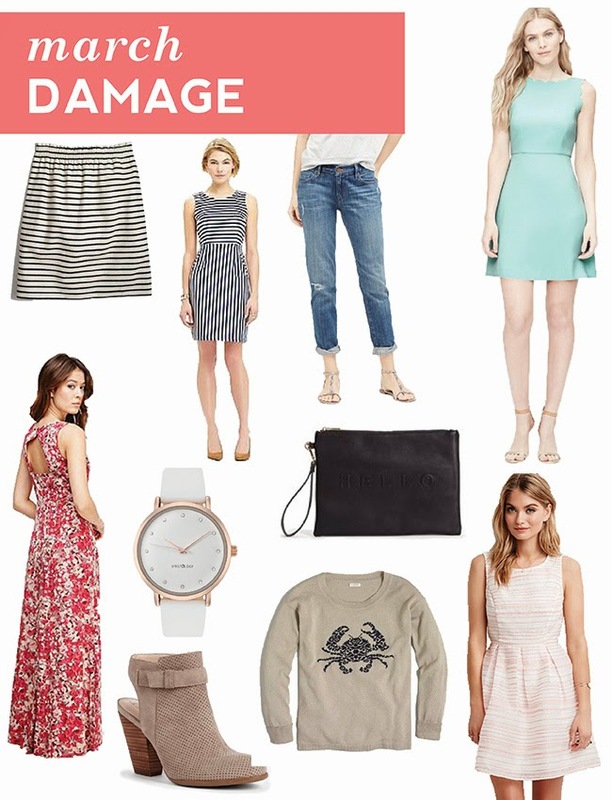 You scored some really great spring essentials. I will be seeking out that scalloped dress. The one J.Crew did a few seasons ago was nice and all, but the fit was terrible. I hope the Loft one is better. It's pretty much a perfect summer wedding dress too. Love that striped skirt and that white watch. Great pieces! So I just got the maxi dress in the mail. I'm 5'9.5" and it could be like, half an inch longer, but I think the length is surprisingly good! So I just got the maxi dress in the mail. I'm 5'9.5" and it could be like, half an inch longer, but I think the length is surprisingly good. I'm with you on the buy dresses when you find them! It is inevitable that you won't find something when you need it (I experienced this when graduation dress shopping and it was miserable). Also, I'm thinking maybe we should get together next time I'm in Chicago! I really like all the dresses you found - and holy crap - ten weddings this summer? Crazy! We only have one, and we're probably not even going to it, haha. I've just started looking at Loft's website more (and placed my first order there for some shorts - fingers crossed they work out! ), and I immediately noticed that scalloped dress. I bet the color will look gorgeous on you!